If You Like Photography, You’re Going to LOVE CLARITY! 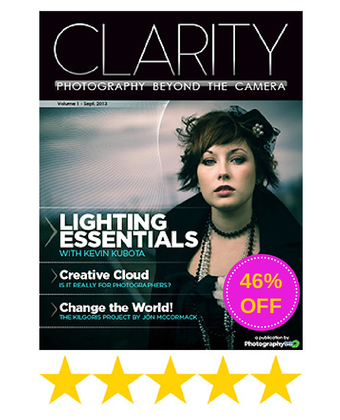 SnapnDeals presents Eight Digital Issues of CLARITY Magazine for only $29.99. Make stronger photographs with a greater understanding of the visual language of photography. Includes Videos to help you dramatically improve your craft. Get the most from your processing workflow with Photoshop and Lightroom. Please Note: Volumes 1-4 are delivered instantly, and future volumes will be automatically delivered (bi-monthly) upon release! CLARITY is the perfect excuse to slip away to your favourite coffee house, park bench, or cozy evening chair while you indulge in the informative, entertaining, and inspirational artistry from a world-class team of photography educators. Every edition is loaded with anticipation as you discover gems inside each article that will make you a better, more well-rounded photographer. When you download these CLARITY eBooks today, you’ll have at your fingertips the move-by-move techniques and secrets that successful photographers use to make visually striking photographs, in any genre. You’ll never feel at a loss for photographing with a visual language that translates into powerful photographic storytelling. It’s like having a whole team of top-professionals to mentor you step-by-step whenever you need them! Learn how to translate your vision into powerful photographs that come alive and truly connect with your viewers. Gain a deeper understanding of crucial issues such as how to develop your creativity, post-processing tutorials, a multi-part guide to Lightroom and Photoshop, how to protect your digital files, “the cloud” for photographers, how to manipulate natural light and portable flash photography, and more. Videos included with every edition! 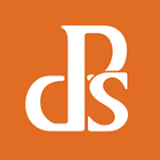 Delivered in PDF format for compatibility with your computer, iPad / Tablet, and even your smartphone! You’ll get 4 complete volumes of CLARITY immediately, plus we’ll deliver 4 more editions automatically (bi-monthly) as they are released! CLARITY includes a team of top photographers who are also some of the best photographic educators in the world. You’ll learn techniques from Kevin Kubota, Piet Van den Eynde, Sean McCormack, Dave Delnea, Jeremy Cowart, Chris Corradino, Jon McCormack, Peter Dorr, Bill McCarroll, Barry J Brady, Lindsay Ostrom, Lee Sacrey, Jay Livens, and Michael Frye; amongst other guest contributors. 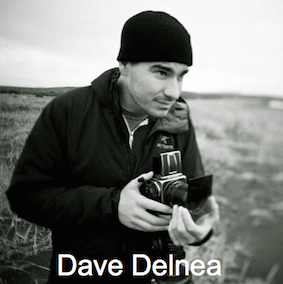 BONUS: Volumes 1+2 also include over 70-minutes of audio with industry-leading commercial photographer, Dave Delnea, on the importance of creative development and collaboration for personal growth. But Wait! These eBooks come with a Goodie Bag! 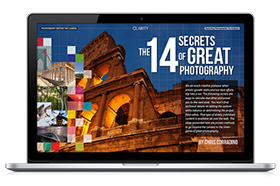 With CLARITY, you get far more than just another photography eBook / Magazine. Every week, you will also receive exclusive INSIDER tips and techniques, including weekly practices specifically designed to produce dramatic improvements. CLARITY gets you more deeply involved by diving into your personal struggles and goals for your photography. All of this to support you as photographer and part of an inside subscribers-circle so that you’ll be further ahead in your photography starting today. This team will proudly hold your hand every step of the way! Get all of this today for only $29.97! You’ll download the first 4 volumes right now, and we’ll deliver 4 more editions automatically (bi-monthly) as they are released!